Esquerda Unida -- Área De Muller. Our Rights Can't Be Cut. United Left -- Area Of Woman. The sticker depicts a young woman speaking out into a purple megaphone with a protest in the background. The megaphone has the symbol for Anarcha-feminism, which is the venus symbol with a raised fist in the center. The black and purple tones in the sticker are also consistent with Anarcha-feminism. 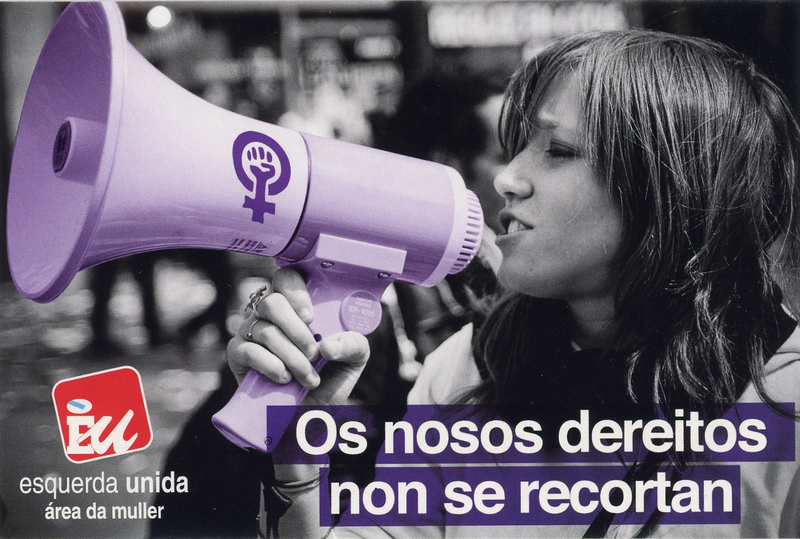 This sticker is from a series of stickers produced by the Esquerda Unida, all of which are centered around this same image of the woman with her megaphone. The stickers were used to advertise National Women's Day in Spain, which fell on Friday March 8, 2013.